1. Jean-Louis Ravelomanantsoa from Madagascar is the fastest athlete to have won the Gift, and is one of just two men to have won the event from scratch – in 1975 he ran the race in 12 seconds off scratch. The fastest time recorded by a winner is 11.6 seconds, by W.I.Howard (5¾ yards) in 1967 and I.A. Miller (9¾ yards) in 1968. 2. In 2005, Athens Olympian Joshua Ross created history to become just the second man to win the event from scratch. In addition, Ross, who first won the Gift in 2003, became just the third man to win the Gift twice, joining Bill Howard who won consecutive Gifts in 1966 and 1967 and Barry Foley who won in 1970 and 1972. 3. In 2006, the Stawell Athletic Club celebrated the 125th edition of Australia’s richest and most famous footrace. As part of the celebrations, the Club conducted a re-enactment of an event conducted at the first Stawell Gift Carnival – the Old Men’s race, with the winner receiving a pig. 4. During the 125th Anniversary carnival in 2006, the Stawell Athletic Club unveiled the top ten Stawell Gift moments of all time, ranking the best ever moments in all events conducted at the Stawell Gift Carnival. Madagascan Jean-Louis Ravelomanantsoa’s historic win from the scratch mark at the 1975 Stawell Gift was voted as the greatest ever moment. 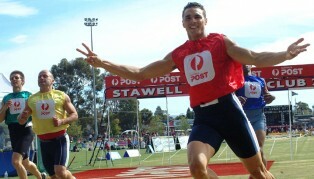 “Ravelo’s” win edged out 2005 winner Joshua Ross, who also won the Gift from scratch, and also relegated Olympic gold medallist Cathy Freeman, dual Stawell Gift winner Bill Howard, American sprint star Warren Edmonson and Scot George McNeill in a top ten that created significant discussion around Stawell. 5. The inaugural winner in 1878 was farmer, W. J. (Bill) Millard who trained by chasing kangaroos. He fathered his 20th child at the age of 69 years. His great grandson Daniel Millard won the Gift in 1997. Bill Millard won £20, his great grandson won $30,000. 6. 2014 is the 133rd running of the Gift (the event was suspended in 1942, 1943, 1944 and 1945 owing to WWII). 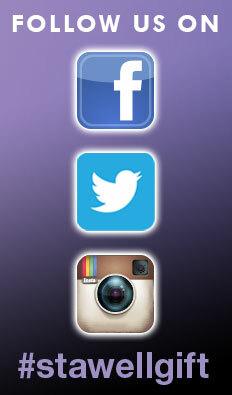 Total prize money for the Gift is $60,000, with $40,000 going to the winner. 7. In 2011, young Canberra sprinter Melissa Breen (11m) became just the fifth female athlete to race against the men in the heats of the Stawell Gift, the 20-year-old following in the footsteps of Nicole Coughlin (10m, 1988), Olympic 400m champion Catherine Freeman (10m, 1995), Nigerian Gloria Kemasoude (10m, 2002) and three-time Olympian Lauren Hewitt (10m, 2004). All won the Gift before going on to compete for Australia at the Olympic Games. Other VFL footballers of note to have competed in the Gift include Jack Grant, a half-back in Geelong’s 1937 premiership team, who played for Geelong and Fitzroy for more than a decade and also won the 1938 Stawell Gift. After winning the Gift, Grant was given a week off by Geelong selectors and invited to make a lap of honour around the Corio Oval before the opening-round match against Melbourne. The next week he returned to football. Fitzroy’s Trevor McGregor won the 1971 Gift. His brother, Murray McGregor, added lustre to the family’s achievements by finishing third in the famous 1975 Gift, which was won in the slush by Ravelo off scratch. McGregor is the most recent league footballer to win the Stawell Gift. In this era of year-round commitment, it’s almost certain that he’ll be the last league footballer to do so. Collingwood’s Bill Twomey became known as the father of Collingwood’s famous Twomey brothers, Bill junior, Mick and Pat, who in 1953 became the only three brothers to play in a premiership team together. But Bill senior was a renowned sportsman himself, playing for Collingwood for five seasons before winning the 1924 Stawell Gift. His win was especially popular with local fans because, by then, he was also the playing-coach of Stawell in the Wimmera Football League. In 1933, almost a decade after leaving Collingwood, Twomey joined Hawthorn and played another two years of league footy. 10. In 1900 the Gift was won by Dave Strickland, father of legendary Olympic champion, the late Shirley Strickland (Delahunty). Strickland was a West Australian who in 1900 had a big year in his adopted state of Victoria. After surviving a protest that was dismissed only after a month’s investigation, he was named the winner of the Stawell Gift. Then, during the subsequent football season, he played his only league game for St Kilda.